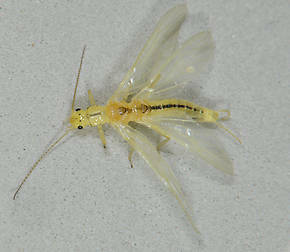 Like most common names, "Little Yellow Stonefly" can refer to more than one taxon. They're previewed below, along with 4 specimens. For more detail click through to the scientific names. 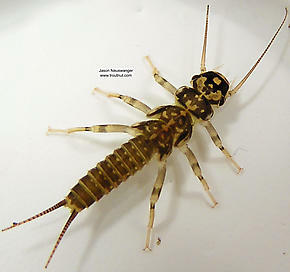 These are pretty much always called Little Yellow Stoneflies. 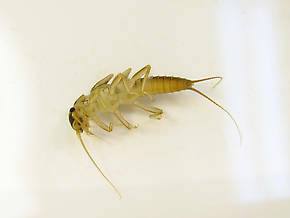 This species is often the most common Perlodidae or Little Yellow Stone In Northern California, especially in mid-elevation rivers and streams. Isoperla quinquepunctata (Little Yellow Stonefly) Little Yellow Stonefly Nymph View 3 PicturesThe dorsal (Dorsal: Top.) patterning is quite unique. 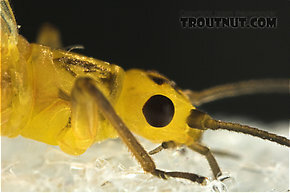 These are often called Little Yellow Stoneflies. This species was formerly classified as Alloperla pallidula.